Despite increasing congressional pressure to improve the number of long, firm-term leases, GSA and its tenant agencies have proven that they are not yet serious about weaning themselves from their addiction to termination rights. 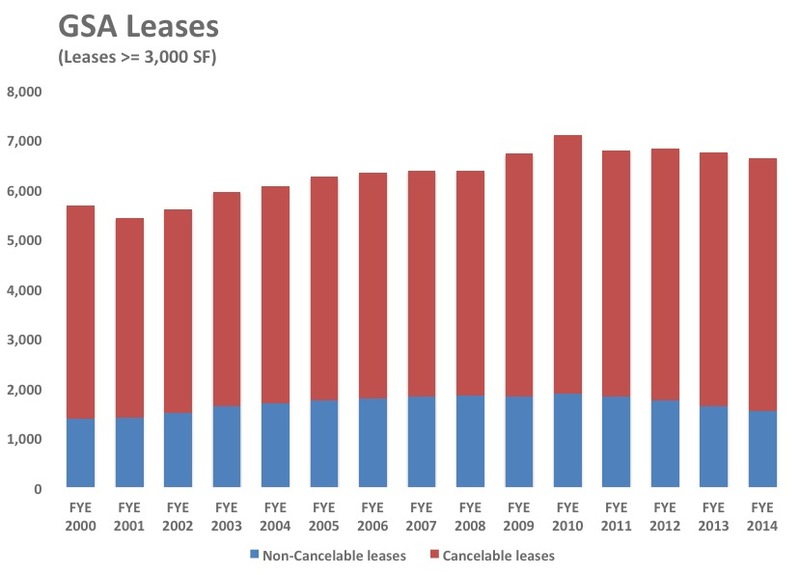 As measured from the leasing peak in 2010 (note: some of the leases in that year are due to short term Census leases), the number of cancelable leases remains nearly unchanged. Yet, during that same five-year period, the number of non-cancelable leases (>=3,000 RSF*) has declined by a little more than 18%. The net result is that GSA has been executing a smaller proportion of non-cancelable leases in an inventory that is also shrinking. That unfortunate trend would be mitigated if the leases that were executed achieved longer firm terms. Alas, they are not. In fairness, I have not studied this in detail, but the back-of-the-envelope analysis is as follows: Currently, in the entire United States there are only 129 leases that have remaining non-cancelable terms of 10 years or more. Given that the pile-up of GSA lease expirations is such that the agency is executing approximately 1,100* lease actions annually, it is pretty easy to conclude that the process is yielding an exceedingly low volume of long firm-term leases. The data in the graph above tracks these figures through the end of the 2014 fiscal year (i.e. 9/30/2014) so the trend could potentially improve when we revisit it again at the end of fiscal 2015. Certainly congressional intervention has ramped up substantially in this past year and we would expect that to have some influence on federal leasing. Yet, so far this fiscal year (looking at the data available through May 2015), we see only a very slight, half percentage point improvement in the ratio of non-cancelable to cancelable leases. As we’ve discovered in our recent study of lease expiration dates, there is some “seasonality” to GSA leasing. So, we will revisit this again at the end of the year to conclusively determine if Congress is having any influence over GSA’s leasing activities or if the agency is merely paying lip-service to its legislative branch colleagues. * Throughout this article we base our analysis on GSA leases that are at least 3,000 RSF in order to improve the focus on traditional leases, eliminating many TSA on-airport leases, storage leases, parking leases and other esoteric leases. GSA Lease Terminations: How Often Do They Occur?